Working with SOLIDWORKS all day every day you would think that those of us working support would know each and every option that SOLIDWORKS has to offer. While we generally know a lot about the software, there are always those options that we do not hear about in the What’s New or that we just don’t notice or test out. The one that we most recently stumbled upon has to do with the SOLIDWORKS Options. At some point after changing your settings around you may want to reset those options back to the default as you do not know what you have changed, so we have a Reset button available to us in the lower left corner. 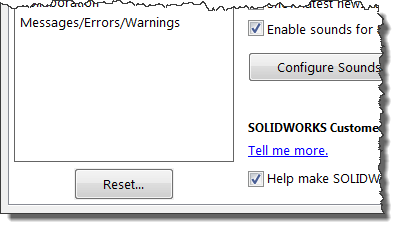 Like most users, we are all afraid to hit this as the thought of going back to the beginning for all the options in SOLIDWORKS generally means we will tweaking different things for the next couple of months. Well we were surprised to find that when you hit the reset you get two options, Reset all options or Reset this page only. 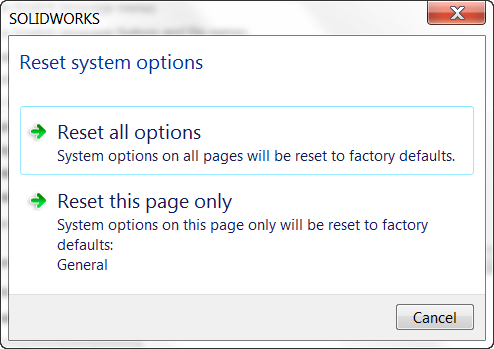 This give us the ability to pick and choose which pages we want to reset. So this just goes to show you sometimes it pays to test out the buttons like Reset to see what options it gives you. We have checked this in both SOLIDWORKS 2015 and 2016 and know it goes back at least that far.